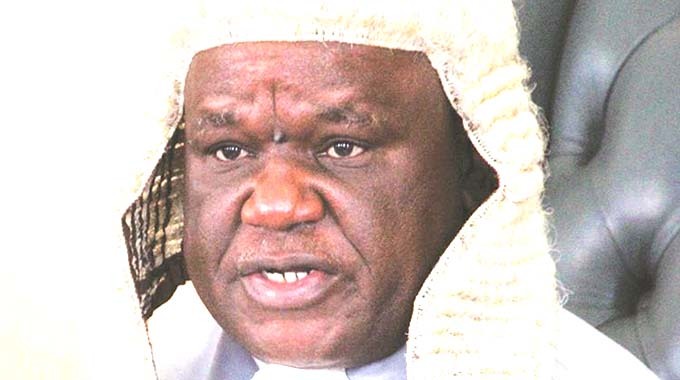 CHIEF Justice Luke Malaba has dismissed as false and unfounded, allegations that Zimbabwe’s Judiciary is “captured”, especially in handling cases related to violent protests that were witnessed recently. He urged those not happy with court decisions to challenge them through the legal route. He said petitions or other extra-judicial avenues will not help the legal practitioners or anyone not satisfied with court decisions. Chief Justice Malaba said petitioning him or the Judicial Service Commission (JSC) to intervene in decisions made by judicial officers was tantamount to interfering with the discretion and independence of those officers. His remarks came as lawyers, most of them pro-opposition and sympathetic to violent protesters that are currently appearing in court, on Wednesday staged a demonstration in Harare. Fronted by some known anti-Government lawyer-activists, they accused magistrates presiding over cases involving suspects arrested for violence of bias or acting under instructions to jail them. They handed over a petition, which was signed by 119 lawyers, to the Chief Justice. In the petition, the lawyers complained of dismissal of preliminary challenges, denial of bail to some suspects and “fast-tracking” of trials. JSC Acting Secretary Mr Walter Chikwana, on behalf of Chief Justice Malaba, issued a statement dismissing the claims saying the courts were not under any form of influence. “The allegations that the Judiciary is acting under capture of an external force remain unfounded, baseless and unsubstantiated. “In the meeting held on 22 January 2019, the Chief Justice gave the Law Society of Zimbabwe (LSZ) his assurance that no directive or instruction was given by himself or the JSC to magistrates to dispose of cases before them in a particular manner. He maintains this position,” said Mr Chikwana. He said the Chief Justice rarely commented on criticism of the justice system, but the present accusations raised by the LSZ were serious and consequential. “The accusation that magistrates countrywide were acting under some form of directive or instructions to influence their decisions is extremely consequential. “The Judiciary cannot take it lightly. All courts in the country and all judicial agents within those courts, must never be interfered with in the dispensation of justice. “The Constitution demands it,” said Mr Chikwana. The Chief Justice said the idea of fast-track courts was necessary under the circumstances and that it was an international practice that is not peculiar to Zimbabwe. “The Chief Justice reminds all and sundry that all judicial officers are required by Section 164(1) of the Constitution to dispense justice expeditiously. “In doing so, all due process must be followed and rights of accused persons respected,” reads the statement. “The Zimbabwean courts are not, by undertaking expeditious trials, reinventing the wheel. Such trials are common phenomenon across the world in cases involving violence. “For instance, in England after the 2011 riots, more than 3 000 people were arrested with 1 500 being arraigned before the courts. “Their trials were fast-tracked. Courts were in session 24 hours until the cases were completed. “Even juveniles caught up in the riots underwent trial,” said Chief Justice Malaba. He insisted on the speedy trial of all accused persons without fear or favour in terms of the law. “The Chief Justice maintains his position that where suspects are arrested and brought to court, they are entitled to a speedy trial. Out of 146 people who were tried in court countrywide, 66 were acquitted while 80 were convicted, a development the Chief Justice said showed the impartiality of the courts. The statistics, the Chief Justice said, confirms that only the guilty ones were being convicted while the innocent would be acquitted.